It's no laughing matter for Sinbad: the IRS is seeking to take his home. The IRS has filed an action in court against the actor/comedian (whose real name is David Adkins) in partial satisfaction of taxes it says he owes. The IRS has filed tax liens in the amount of $8.15 million in tax liens against Sinbad. The tax obligations range from $157,934 in 2003 to $2,358,563 in 1998. Penalty and interest continue to accrue for all years while the matter remains outstanding. According to court documents, (downloads as a pdf) Sinbad filed an Offer in Compromise, called an Offer or OIC, in 2003 to resolve the liabilities for tax years 1998 through 2001. That OIC was rejected in 2004. Offers are typically rejected when the payment offered is too low or if the IRS otherwise believes that it can collect the full amount. An OIC may also be rejected if the taxpayer is noncompliant at the time of filing (meaning that the taxpayer has failed to file tax returns for the current year or years which follow the period of the OIC). A second OIC was submitted to the IRS in 2005 for the tax years 1998 through 2003. It was accepted by the IRS but Sinbad refused to comply with the terms. Generally, failure to comply means that the taxpayer either failed to make timely payments as agreed to or failed to remain compliant with the IRS. Approximately six months after acceptance of the OIC, IRS claimed that Sinbad was officially in default and the terms of the offer were no longer good. The court documents seeking seizure of the house were filed on Dec. 10. The filing noted that other creditors may exist, including JPMorgan Chase Bank, Franchise Tax Board for the state of California and Hidden Hills Community Association; each has been referred to as a "lien creditor" against Sinbad's property. At one point, Sinbad reportedly had the third highest active tax delinquency in the state of California at $2,522,424.10 -- just above Dionne Warwick. 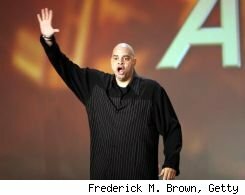 On Dec. 11, one day after the IRS papers were filed, Sinbad filed Chapter 7 bankruptcy in California, reporting a whopping $10 million and $50 million in liabilities and less than $50,000 in assets (the home that Sinbad lives in is owned by his brother, an arrangement the IRS believes to be a sham). The 53-year-old actor got his start on Star Search -- he beat fellow comedian Dennis Miller in the competition. He went on to star in several TV and movie projects, including Bill Cosby's "A Different World," "Houseguest" and "Jingle All the Way." He is reportedly not active in any current major projects.